Use wire or an equivalent tool to keep the front disc brake caliper assembly from hanging down by the flexible hose. 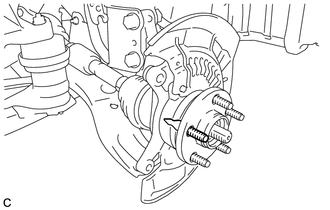 (a) Position the front axle hub bolt to be removed as shown in the illustration. 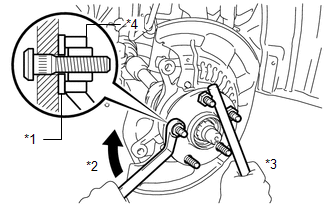 (b) Temporarily install the 2 nuts to the front axle hub bolt as shown in the illustration. Install the nuts to prevent damage to the front axle hub bolts. (c) Using SST and a brass bar or an equivalent tool to hold the front axle hub, remove the front axle hub bolt. 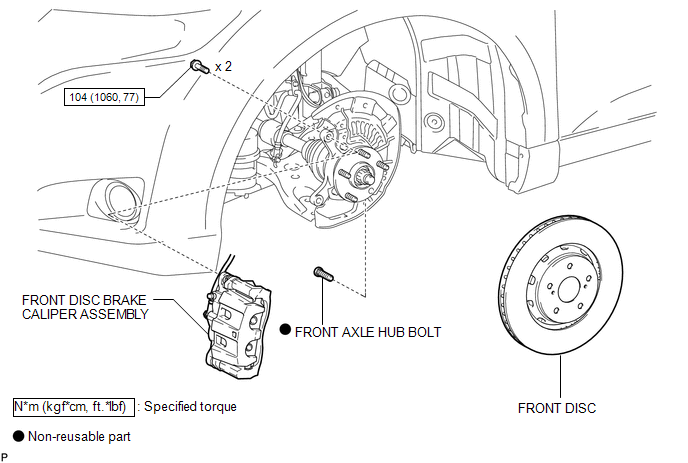 (a) Position a new front axle hub bolt to be installed as shown in the illustration. (b) Temporarily install the new front axle hub bolt to the front axle hub. 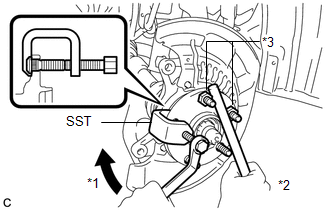 (c) Install a washer and nut to the new front axle hub bolt as shown in the illustration. (d) Using a brass bar or an equivalent tool to hold the front axle hub, install the front axle hub bolt by tightening the nut. Do not damage the threads of the front axle hub bolts. (e) Remove the 3 nuts and washer from the 3 front axle hub bolts. 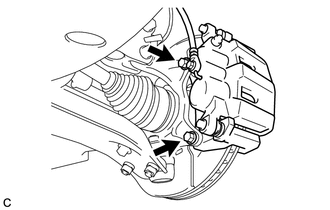 Do not twist the brake hose when installing the front disc brake caliper assembly.